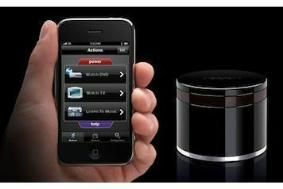 Gear4 launches UnityRemote, its iPad, iPod Touch and iPhone universal remote | What Hi-Fi? UnityRemote comprises an app for the handhelds, plus a battery-powered infrared 'flasher' unit with 360-degree coverage, powered by three AA batteries and connected to the iPod Touch, iPad or iPhone via Bluetooth. The software is entirely customisable to control single devices or a complete systems, and users can build a control screen combining, say, the disc controls for a Blu-ray player and the volume adjustment for an AV receiver. Alternatively, 'events' can be set up, comprising a series of commands, for example to turn on a TV, Blu-ray player and AV receiver, select the correct inputs and start a disc. The Gear4 UnityRemote is available now.